This exhibition presents nearly 50 prints by three Japanese artists who rose to international prominence in the decades following World War II. All of them embraced abstraction, that most quintessential of Western modernisms, as a means for expressing fundamentally Japanese themes. Hagiwara Hideo (1913–2007) combined abstract expression with imaginative approaches to traditional Japanese woodblock techniques to create prints of great visual depth. Winner of multiple international print exhibition prizes, Hagiwara taught printmaking at Oregon State University in 1967. Takahashi Rikio (1917–1998) is known for his prints evoking Japanese gardens throughout the seasons, without ever depicting a plant or stone. 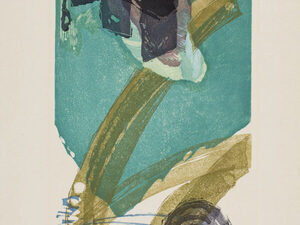 Working almost exclusively in woodblock, he created images that convey stillness, balance and a sense of timelessness. Ida Shōichi (1941–2006) took abstraction to radically new levels. For him, the techniques of silkscreen, lithography, etching and traditional woodblock printing were not instruments for creating images, but forces that act upon or emerge from the paper. In his reverence for the potential inherent in the materials, Ida harks back to aesthetic values of the Japanese tea ceremony and Mingei movement. This exhibition draws upon prints in the Museum’s collection and from the Lavenberg Collection of Japanese Prints. Organized by the Portland Art Museum and curated by Maribeth Graybill, The Arlene and Harold Schnitzer Curator of Asian Art, with Irwin Lavenberg, Research Associate for Japanese Art.